This female northern elephant seal pup was found starving on a beach in San Luis Obispo County, at the southern end of the Center's rescue range. Megan was not completely weaned from her mother, and as a result, could not feed on her own and survive in the wild. 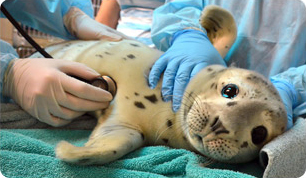 At the Center, she was fed fish mash – a fish milkshake of sorts consisting of salmon oil, herring, and cream. Eventually, Megan learned how to seek and eat whole fish as part of the Center's "fish school" in which volunteers teach young elephant seals how to eat fish. Elephant seals are not born with the natural instinct to hunt and eat fish – they develop these skills by playing in the tide pools with other pups. Once Megan was healthy, she was released near Point Reyes National Seashore.